Welcome to Drying Ink, blog hoppers! I review an eclectic mix of fantasy and science fiction, with my favourite authors including Robin Hobb, Steven Erikson, and Patrick Rothfuss. I also include a number of articles and toplists: just below this post, for example, you can find my (very subjective) ranking of what I think are the best five fantasy (non review) blogs. I've been lucky enough to be featured today (why, thank you) and it'd be great if you could stop by and say hello in the comments. Have you ever wanted the villain to win at the end of a story? If so, which one? Oh, it's a tough one - but I think I'm going to have to go for Brandin from Tigana, which is definitely one of my favourite fantasies. He might be an antagonist, but he and one of the viewpoint characters are in love - and he's begun to make amends for what he did. And then... Well, I won't spoil the ending for you - you should read it. But let's just say the protagonists are almost as grey as Brandin, and it might even be Brandin we're cheering for! In close second place has to come Tywin Lannister, I think - he's nasty, plots for the betterment of Lannister without any qualms whatsoever... And we just can't wait to see what he does next. Maybe Tyrion would be a better choice, but more properly, I think, he's a protagonist. We see through his eyes, and Stannis is scarcely a hero either - and that is who Tyrion attempts to thwart, for the most part! I always kind of wanted Mrs. Coulter to end up on top. Or maybe see the war against Voldemort even out before his downfall (something more realistic - not an immediate win on behalf of the good guys). But sometimes it depends on how you define villain. I can't think of any specific examples right now, but there have definitely been a few where I actively rooted for the alleged antagonist (typically in books I seriously disliked, though, perhaps in a sense of spite against the protagonist). Anyways, I typically don't like the concept of villains... it's much more fun when there are just a bunch of complex and multifaceted characters, some of whom you just know more about than others...! Good on ya for finding a villian - I couldn't think of one! Hello! I'm a new follower hopping through. I'm thrilled with your answer though I haven't read any of those books. I guess I just have a very lame answer for this Friday's question. Anyway I hope you can hop by on my blog =) Congratulations on being this week's feature blogger! Hopping by...Come by and read my hop answer as well as enter the two giveaways at the end of the post @ Ashley Suzanne! I am a new follower and would love a follow back! Congrats on being the feature, Jacob! I'm a new follower for sure! Hi I'm a new follower! This is the first question that's really stumped me, kudos to you for finding one! Well, good for you for actually having an answer to this question. I could only come up with Anakin/Darth Vader... Does that even count?! congrats on the feature. I'm a new follower! Hi, I'm a new follower! Several books came to my mind with this question, which probably makes me an evil reader. Congratulations on the feature! This was a tough question. I could only come up with one and that was because I disliked the heroine. Congrats on being featured! I'm a new follower. ^_^ Here's my Follow Friday. Stopping by on the hop....interesting book, I need to add that to my TBR list! 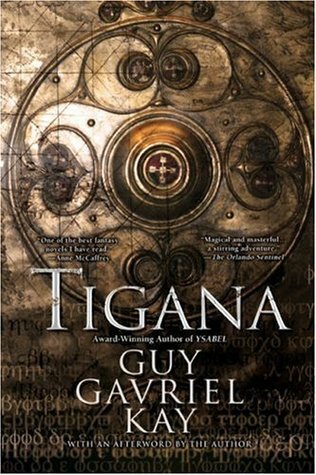 I haven't read Tigana, but I've heard awesome things about it! I'll definitely have to check it out now! P.S. I'm def up for our guest post exchange! Maybe we can try to put something together for later this month! Sorry I've been MIA! I haven't read the book. Must check it out! Congrats on being featured this week! I've never heard of the book you mention, but I ADORE Tyrion Lannister. Great character that really stands out in a large cast of characters. I'm you're newest follower and would love for you to visit me when you get a chance. Awesome post. I totally agree with you. Most epic fantasy is really not g vs e it's all just one big grey area. That's exactly what I was trying to get at in my post. Check it out if you like"
That's interesting, since I haven't heard of any of those from what I recall. But you've definitely made me interested! I do know a few villains I've started to like with time in series' and some I haven't actually hated, but I haven't rooted for them. I only remember doing that with some in movies, lol. Congratulations on being featured! :D I'm a new follower. Hope you have an awesome weekend! My answer can be found here! Congrats on the feature! Hopping through to follow. Great answer. This one is a tough question. So glad to find a fantasy blog!!! Yeah, I haven't decided how I'm going to answer this question yet-- by the way, the cover of this book Tigana is AWESOME!!! I am definitely going to check it out! New follower here hopping through! Congrats on being a featured blogger! Great answers. I didn't think of the Lannisters or any other characters from the Song of Ice and Fire series, but there really are a lot of great villainous characters from these books that I definitely love. I'm glad you came up with an answer. I was shocked by the question and say yes. Except I'm stuck on which villain I would want to have the end of the book. It's been so long since I've read that, I'm going to have to think about it. You can find me here here. Congratulations on being the featured blog on Follow Friday. I look forward to "getting to know you" as I'm a new follower. I can think of several villains I wish had had more luck, like Willoughby in Sense and Sensibility, and Henry Crawford in Mansfield Park. Of course, those guys weren't really villains, more cads. Congratulations on being the feature!! I found this question incredibly difficult to answer ... I don't think I really answered it at all in the end, haha. But now that I read yours, I should have wrote Tyrion! He's definitely a favourite character of mine! But I guess since aSoIaF has such gray characters, I never *really* thought of him as a true villain. Congratulations on being this weeks feature! Congrats for being a feature this week!! I am also a new follower! Congrats on being this weeks feature. I'm a new follower. Congratulations on being a featured blog!!! Have a wonderful week! Just hopping by and following through! Congrats on being featured this week! Ooh congrats on the feature. I was extra excited today to find another fantasy lover :) You've gone straight (or will in a bit, promise) to my reader. Tigana's pretty high up on my fantasy wishlist just a little low on cash at the moment and trying to sort out my disjointedly owned series. I love the sound of Kavriel's work, as much as I do adore the medieval-England style of fantasy, it's nice to have something a little different from time to time. So yeah, hello! I haven't read Tigana, but reading your answer made me want to add it to my TBR. After all, if the Lannisters come in a close second... I almost added Tyrion and Jaime to my own Follow Friday answer, but then I wondered whether they do count as villains, since they have plenty of redeeming points and are, all around, better folks than Stannis. In a book like A Song of Ice and Fire, what makes a villain anyway? They are all too realistic, too human for the term, I guess... But still, it makes me wish I had chosen them! As for this week's question, I've been reading A Game of Thrones--and Tyrion is *TOTALLY* my fave bad guy that I want to win!!! Congrats on the Feature! I also love science fiction and fantasy, my answers were Anakin and Gollum, can you get any neekier? Stopping by for the FF! Congrats on being featured! Congrats on being featured! New follower! Come see my answer. I have never heard of this book. SOunds interesting though. I haven't heard of this book yet. Sometimes I root for the villains to get their happy endings, but I can't remember specific books. Congrats on being this weeks pick! New follower! Have a great weekend and I love your blog! I love your answer. It does become more difficult in those books where the bad guys have more shades of grey. hi! I'm a new follower, I'm glad I came over from Alison Can Read! I haven't read this book yet, so I didn't really read your answer, incase there were spoilers! But my answer over on Fuzzy.Coffee.Books was Snape from HP. I know, I know, he wasn't really the bad guy, but he sorta was the whole time until the end. And I didn't want him to die. Hello, a new follower here! Congrats on being featured this week! I'd actually never heard of Tigana before, but it sounds good, I'm going to have to check it out. Have a great weekend! Hi! I hate it when villians start to redeem themselves, messes with the emotions :0) Congrats on being this weeks feature! Tigana sounds right up my alley, added to the tbr list! Congrats on the feature, new follower hopping through. Hiya. I hadn't heard of this series, but it sounds pretty good. I'm a new follower and I'm always excited to find other UK bloggers. Congrats on being the feature. Congrats on being the featured blog! New follower too. I'm not familiar with the books but I've started watching Game of Thrones. :) We get more invested on grey characters I guess. Rhett Butler wasn't a nice guy and I was rooting for him. Here's my post: I've Never Met a Genre I Didn't Like. I'd also invite you to sign up for the contest to win a $25 Amazon giftcard this month at my blog. A good writer does that: gives you a human antagonist that you can identify with. New follower, come see me! Congrats on being the featured blog! Love your site!